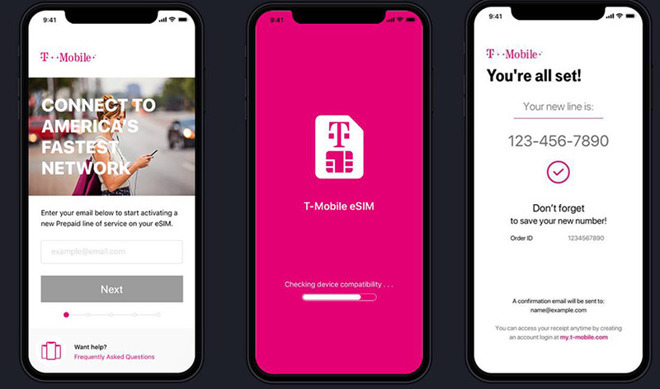 T-Mobile's eSIM app for iPhone. T-Mobile showed off the standalone iOS app to PCMag, offering a sneak peek at how the carrier intends to handle Apple's Dual SIM, Dual Standby solution. As detailed by the publication, the app activates a prepaid service line on a host iPhone by walking users through a simple setup process. Subscribers are asked to provide an email address — ostensibly linked to their T-Mobile account — for authentication and verification of services. The app proceeds to check device compatibility before provisioning the onboard eSIM and assigning a secondary phone number. The app is currently restricted to prepaid plans, as most users will likely add a roaming or secondary line to their eSIM instead of a primary plan, the report said. The streamlined activation experience stands in stark contrast to systems in use by competing carriers like AT&T, which require customers to scan a QR code at a brick-and-mortar store. It should be noted, however, that AT&T's eSIM support extends to both prepaid and postpaid plans. T-Mobile plans to distribute the app to personnel for training on Friday ahead of a public debut later this month. An exact launch timeline was not provided, though sources familiar with the company's plans claim the carrier will enable eSIM support by the end of the year, the report said. AT&T was the first U.S. carrier to activate eSIM compatibility for iPhone when it rolled out support on Wednesday, enabled by the release of iOS 12.1.1. Introduced with the latest iPhone XS and XR models in September, dual-SIM technology enables the use of two phone numbers and two subscription plans on a single device. Popular in Asia, the tech allows users to save on roaming charges during international travel or maintain separate business and personal lines without extra hardware.